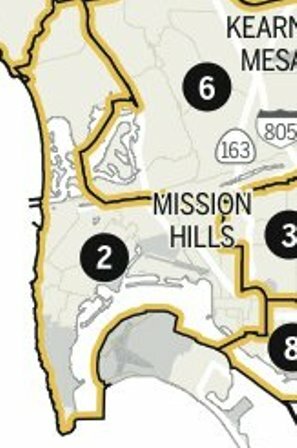 New appointee must live within the boundaries of the “old” District 2 before they were redrawn in 2011. Here above are the old boundaries. 1. A 30-day clock starts on the day Kevin is sworn in as Mayor, which we think will be around March 3. The county Registrar of Voters has 28 days (from Feb. 11) to count the ballots and certify the results. Because the election wasn’t that close, it could take less than 28 days. Upon receiving registrar certification, the Clerk will ask the Council President to docket acceptance of those findings at the next possible meeting. 2. Council approves the election results and Kevin is sworn in as Mayor. This begins a 14-day application period (calendar days) for candidates wanting to fill the interim D2 vacancy. They must reside in the old District Two – as the boundaries existed before being redrawn last year – because that’s the pool from which Kevin was elected. 3. Candidates for the vacated seat must gather at least 50 signatures of support from registered voters in (old) D2. They’ll have to also have to submit a downloadable application form and statement of economic interests, as well as an essay-style “statement of qualifications” of no more than 500 words. Additionally, all candidates will undergo a police background check. 4. After the 14-day filing period, the Clerk will post names of all of the candidates who meet the qualifying criteria. This is the field from which the Council will select an appointee. 5. If there are only a small number of qualified candidates and it’s an easy choice, the Council could make its selection in one meeting. If there’s a large number or disagreement among the Council the Municipal Code allows for the process to extend to two meetings – one to winnow the field and a second to make the selection. 6. The Interim Councilmember is sworn in. All of this must take place within 30 business days (about six weeks) of Kevin’s inauguration. Within the next few days the Clerk expects to have these instructions posted in plain language on her Web site . And for anyone wanting more detail, the appointment requirements are spelled out in San Diego Municipal Code Chapter 2, Article 7, Division 8: “Procedure for Filling Vacancies in Elective Office by Appointment” (which is also accessible on the Clerk’s Web site). Here are the 2 maps; the appointee must be from the “old” map before the “new” map was approved. We’re still waiting to hear from some locals who are pondering the question of whether to throw their hat into the proverbial ring to be appointed. The boundary rule means that someone could be appointed from the old district to represent the new district, that is someone from downtown, for instance, could be appointed; the old district included downtown and the new one doesn’t (to a large extent). This scenario would not be very fair or representative of the people in the district today. Chet forgot to add that whoever is appointed by the council will be an “interim” councilmember, and will not be eligible to run for the full term in November.